There is large dental decay that causes a significant loss of your natural, healthy tooth structure. What most patients don’t realize is that once you lose a certain amount of your healthy tooth structure, it compromises the integrity and function of that tooth. If left alone, not only will the tooth continue to deteriorate and eventually lead to pain, but you may also risk losing the tooth entirely. When large fillings are compromised. Dental fillings are meant to be placed in a tooth when there are small areas of tooth decay or voids in a tooth. However, the larger those fillings are, the weaker it will be become over time and eventually shatter or break. This is because the materials used in a filling are not as durable or sturdy as a dental crown can be. So when there is a tooth that needs the extra support due to heavier load, a dental crown is always the best option to preserve the tooth. When you have a root canal treatment. A root canal procedure is when the pulp or nerves of a tooth are entirely removed due to infection, inflammation, decay involving the nerve, lingering sensitivity, or pain. Once your tooth has a root canal, the tooth is essentially “dead” as it has no nerves inside and as a result of this, can become vulnerable. A dental crown is thus needed to cover the tooth and protect it from breaking and reinforce it from the day to day functions of chewing, biting, clenching, or grinding. When you want to change the appearance of your tooth or smile. Sometimes a patient may be unhappy with the natural anatomy, contour, or color of their teeth. A dental crown can be used to cover or mask these. With a porcelain crown, we can completely change the esthetics of the tooth and make it look exactly like we want! Tooth Loss. Sometimes a tooth can be so worn down, cracked, or broken that a filling is not strong enough to support it. 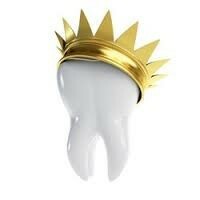 A dental crown is then needed to reinforce the tooth and prevent it from being further damaged or having to remove it. We are in the business of creating happy and healthy smiles so if you think you may need a crown, let Dr Dave’ and our amazing team help you!